Having read the newly translated Midwinter Sacrifice published in the UK in October 2011, I meet Mons Kallentoft on a hot sunny day in a small London Hotel. I had wondered whether he would be as intense as both his photographs and book indicated and am relieved when he offers a engaging smile and happily sits down to chat with me. 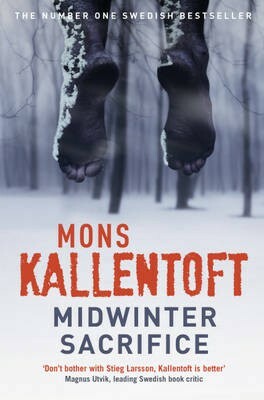 Midwinter Sacrifice is the first book to be translated for the UK in his series about Malin Fors, a female Police Detective set in Sweden, who balances the investigation of murders with her home life, which involves bringing up her teenage daughter alone. Mons grew up in a working-class household in the provincial town of Linkoping, Sweden, where the Malin Fors series is set. Before becoming a writer, he worked in journalism and is also a keen food critic. ‘I enjoyed my time travelling and still do,’ he tells me and whilst always wanting to write, ‘used what was around me and things I saw.’ His first novel, Pesetas, was awarded the Swedish equivalent of the Whitbread Award and was of a more thriller style. He has been married to Karolina for over 20 years, and they live in Stockholm with their daughter and son. What started him on the Malin Fors path I ask? ‘I wanted to do something different and whilst she (Malin) is looked at as being the typical Scandinavian hero, she is female and that brigs a different perspective’. Does he find that hard? Writing as a woman? He laughs and notes, ‘I don’t necessarily see her as a woman, but a detective looking for answers and yet coping with parenthood and all the other stresses in life’. I knew that Midwinter Sacrifice is not the first book in the series, just the first translated, so wanted to find out if he felt readers can start there. ‘Yes. The books are a series and it is important to see her growth, but it’s not integral to not have read the others’. He thinks more, before confirming, ‘The stories do often link, but can all be read as standalones, especially this because it is about the characters and personalities that link to what happens’. So are you enjoying being published here and yet almost being considered new? ‘Oh well, I am here,’ he smiles. ‘It is good to be in England and I have met many interesting people and been very much welcomed. Plus the weather has been great!’ I have to agree there, he has picked one of the best weeks of the year. ‘I am enjoying meeting people and getting a fresh perspective on my books when I am talking about them’. He’s clearly not finding the language barrier an issue either with his English being very good. ‘Thank you. It can be hard, but mostly I am managing and people are very patient’. Yes well, unfortunately many Britons of us are not great at learning languages and I reiterate that his abilities are excellent, we are not having trouble understanding each other at all. Talking more about Midwinter Sacrifice, he seems surprised and happy that I have read it, striking me as very sweet and humble, which he is throughout. ‘You liked it?’ Yes, I did and much of that was because it wasn’t typical characterisation of either the protagonists or the story. ‘Where did it come from? Sitting forward he tells me that ‘For me its all about the dark side of human nature and what brings about the way things happen. Coming to a conclusion where the bad guy (the murderer) is caught, is one part, digging deeply into the reasons is another. This to me was about the murderer and I wanted to write about the outcast, the person no-one knows or cares about and how the impact of that death would affect those involved’. But, I ask, who actually was the villain? I didn’t think that either the victim or murderer were and without giving the plot away, there was the other party. He smiles at me, showing that he can really see I have read it and understand where he was aiming. ‘Yes. That was a huge part of what I wanted – the abused becomes the abuser or actually do they? Who and what is it that causes things to go the way they do and the differing depths of human nature’. He continues telling me that parts of Sweden are as bleak as how he has described them and that in itself led to the story. ‘When you see something like that, the small towns the hardship, those on the outside it gives you ideas on what would happen in this circumstance or maybe in that one’. He ponders the thought more and continues, ‘A lead character can never get predictable or boring, but has to be in your head feeding you constantly, if they stop doing that then its time to give up that one and move on. I want Malin to have different experiences and the types of crimes that provoke the thought as well as entertainment to the reader’. So you wont be ending the series soon? ‘No, I don’t think so. I am contracted for more and there are still stories there, but if that changes,’ he shrugs, ‘then I will think again’. As the sun streams through the windows in the old fashioned library we sit in, we chat about life and family, who he misses whilst being away, he signs my book for me and we say goodbye. Stepping out into the sunny afternoon, my head is filled with the conversation and makes me smile.